Bodhbh [Bove] Derg, son of the Dagda, was chosen king; and Manannan, their chief counsellor, they arranged the different places of abode for the nobles among the hills. Several of the sidhs mentioned in this narrative are known, and some of them are still celebrated as fairy haunts. Sidh Buidhbh [Boov], with Bove Derg for its chief, was on the shore of Lough Derg, Portumna. When you see swans on Lough Derg again you may see them differently! In the days of long ago there lived in the Green Isle of Erin a race of brave men and fair women—the race of the Dedannans. North, south, east, and west did this noble people dwell, doing homage to many chiefs. Forth from among the Princes rose five well fitted to wield a sceptre and to wear a crown, yet most royal stood Bove Derg and Lir. And forth did the five chiefs wander, that the Dedannan folk might freely say to whom they would most gladly do homage as King. Not far did they roam, for soon there arose a great cry, “Bove Derg is King. Bove Derg is King.” And all were glad, save Lir. But Lir was angry, and he left the plain where the Dedannan people were, taking leave of none, and doing Bove Derg no reverence. For jealousy filled the heart of Lir. But wise and generous was Bove Derg, and he bade the warriors do no hurt to the offended Prince. For long years did Lir live in discontent, yielding obedience to none. But at length a great sorrow fell upon him, for his wife, who was dear unto him, died, and she had been ill but three days. Loudly did he lament her death, and heavy was his heart with sorrow. When these words were told to Lir, his heart was glad. Speedily he called around him his train, and in fifty chariots set forth. Nor did they slacken speed until they reached the palace of Bove Derg by the Great Lake. And there at the still close of day, as the setting rays of the sun fell athwart the silver waters, did Lir do homage to Bove Derg. And Bove Derg kissed Lir and vowed to be his friend for ever. And when it was known throughout the Dedannan host that peace reigned between these mighty chiefs, brave men and fair women and little children rejoiced, and nowhere were there happier hearts than in the Green Isle of Erin. And Eve, the eldest of the fair maidens, was glad, and that day was she married to Lir, and after two weeks she left the palace by the Great Lake and drove with her husband to her new home. Happily dwelt Lir’s household and merrily sped the months. Then were born unto Lir twin babes. The girl they called Finola, and her brother did they name Aed. Yet another year passed and again twins were born, but before the infant boys knew their mother, she died. So sorely did Lir grieve for his beautiful wife that he would have died of sorrow, but for the great love he bore his motherless children. So messengers rode forth to carry these tidings to Lir, and in time Lir came again to the palace of Bove Derg by the Great Lake, and he married the beautiful Eva and took her back with him to his little daughter, Finola, and to her three brothers, Aed and Fiacra and Conn.
Four lovely and gentle children they were, and with tenderness did Eva care for the little ones who were their father’s joy and the pride of the Dedannans. As for Lir, so great was the love he bore them, that at early dawn he would rise, and, pulling aside the deerskin that separated his sleeping-room with theirs, would fondle and frolic with the children until morning broke. And Bove Derg loved them well-nigh as did Lir himself. Ofttimes would he come to see them, and ofttimes were they brought to his palace by the Great Lake. And through all the Green Isle, where dwelt the Dedannan people, there also was spread the fame of the beauty of the children of Lir. And for weeks and months Eva lay in bed planning how she might do hurt to the children of Lir. At length, one midsummer morn, she ordered forth her chariot, that with the four children she might come to the palace of Bove Derg. When Finola heard it, her fair face grew pale, for in a dream had it been revealed unto her that Eva, her step-mother, should that day do a dark deed among those of her own household. Therefore was Finola sore afraid, but only her large eyes and pale cheeks spake her woe, as she and her brothers drove along with Eva and her train. Then Eva, filled with rage, drew forth her sword to slay them with her own hand, but too weak for the monstrous deed, she sank back in the chariot. Onward they drove, out of the gloomy pass into the bright sunlight of the white road. Daisies with wide-open eyes looked up into the blue sky overhead. Golden glistened the buttercups among the shamrock. From the ditches peeped forget-me-not. Honeysuckle scented the hedgerows. Around, above, and afar, carolled the linnet, the lark, and the thrush. All was colour and sunshine, scent  and song, as the children of Lir drove onward to their doom. . . .AS SHE TOUCHED AED, FIACRA, AND CONN, THE THREE BROTHERS WERE AS THE MAID. Not until they reached a still lake were the horses unyoked for rest. There Eva bade the children undress and go bathe in the waters. And when the children of Lir reached the water’s edge, Eva was there behind them, holding in her hand a fairy wand. And with the wand she touched the shoulder of each. And, lo! as she touched Finola, the maiden was changed into a snow-white swan, and behold! as she touched Aed, Fiacra, and Conn, the three brothers were as the maid. 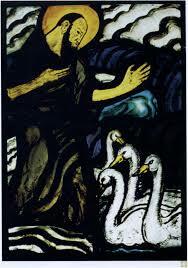 Four snow-white swans floated on the blue lake, and to them the wicked Eva chanted a song of doom. “Evil is the deed thy magic wand hath wrought, O Eva, on us the children of Lir, but greater evil shall befall thee, because of the hardness and jealousy of thine heart.” And Finola’s white swan-breast heaved as she sang of their pitiless doom. Then did Eva order the horses to be yoked to the chariot, and away westward did she drive. And swimming on the lone lake were four white swans. When Eva reached the palace of Bove Derg alone, greatly was he troubled lest evil had befallen the children of Lir. But Bove Derg believed not his foster-daughter, and that night he secretly sent messengers across the hills to the dwelling of Lir. When the messengers came there, and told their errand, great was the grief of the father. And in the morning with a heavy heart he summoned a company of the Dedannans, and together they set out for the palace of Bove Derg. And it was not until sunset as they  reached the lone shore of Lake Darvra, that they slackened speed. Lir alighted from his chariot and stood spell-bound. What was that plaintive sound? The Gaelic words, his dear daughter’s voice more enchanting even than of old, and yet, before and around, only the lone blue lake. The haunting music rang clearer, and as the last words died away, four snow-white swans glided from behind the sedges, and with a wild flap of wings flew toward the eastern shore. There, stricken with wonder, stood Lir. “Know, O Lir,” said Finola, “that we are thy children, changed by the wicked magic of our step-mother into four white swans.” When Lir and the Dedannan people heard these words, they wept aloud. And Lir and his people stayed on the shore that night and until the morning glimmered. Then, with the dim dawn, silence stole over the lake. Speedily did Lir rise, and in haste did he bid farewell to his children, that he might seek Eva and see her tremble before him. Swiftly did he drive and straight, until he  came to the palace of Bove Derg, and there by the waters of the Great Lake did Bove Derg meet him. “Oh, Lir, wherefore have thy children come not hither?” And Eva stood by the King. A silence as the silence of death fell upon the three, and all was still save that Eva trembled greatly. But ere long Bove Derg spake. Fierce and angry did he look, as, high above his foster-daughter, he held his magic wand. Awful was his voice as he pronounced her doom. “Wretched woman, henceforth shalt thou no longer darken this fair earth, but as a demon of the air shalt thou dwell in misery till the end of time.” And of a sudden from out her shoulders grew black, shadowy wings, and, with a piercing scream, she swirled upward, until the awe-stricken Dedannans saw nought  save a black speck vanish among the lowering clouds. And as a demon of the air do Eva’s black wings swirl her through space to this day. And when it was told throughout the Green Island of Erin of the fate of the children of Lir and of the vow that Bove Derg had vowed, from north, south, east, and west did the Dedannans flock to the lake, until a mighty host dwelt by its shores. And by day Finola and her brothers knew not loneliness, for in the sweet Gaelic speech they told of their joys and fears; and by night the mighty Dedannans knew no sorrowful memories, for by haunting songs were they lulled to sleep, and the music brought peace to their souls. Slowly did the years go by, and upon the shoulders of Bove Derg and Lir fell the long white hair. Fearful grew the four swans, for the time was not far off, when they must wing their flight north to the wild sea of Moyle. And when at length the sad day dawned, Finola told her brothers how their three hundred happy years on Lake Darvra were at an end, and how they must now leave the peace of its lone waters for evermore. Then, slowly and sadly, did the four swans glide to the margin of the lake. Never had the snowy whiteness of their plumage so dazzled the beholders, never had music so sweet and sorrowful floated to Lake Darvra’s sunlit shores. As the swans reached the water’s edge, silent were the three brothers, and alone Finola chanted a farewell song. With bowed white heads did the Dedannan host listen to Finola’s chant, and when the music ceased and only sobs broke the stillness, the four swans spread their wings, and, soaring high, paused but for one short moment to gaze on the kneeling forms of Lir and Bove Derg. Then, stretching their graceful necks toward  the north, they winged their flight to the waters of the stormy sea that separates the blue Alba from the Green Island of Erin. And when it was known throughout the Green Isle that the four white swans had flown, so great was the sorrow of the people that they made a law that no swan should be killed in Erin from that day forth. With hearts that burned with longing for their father and their friends, did Finola and her brothers reach the sea of Moyle. Cold and chill were its wintry waters, black and fearful were the steep rocks overhanging Alba’s far-stretching coasts. From hunger, too, the swans suffered. Dark indeed was all, and darker yet as the children of Lir remembered the still waters of Lake Darvra and the fond Dedannan host on its peaceful shores. Here the sighing of the wind among the reeds no longer soothed their sorrow, but the roar of the breaking surf struck fresh terror in their souls. And Aed answered, “Wise art thou, dear, gentle sister. If we be driven apart, may it be to meet again on the rocky isle that has ofttimes been our haven, for well known is it to us all, and from far can it be seen! Darker grew the night, louder raged the wind, as the four swans dived and rose again on the giant billows. Yet fiercer blew the gale, until at midnight loud bursts of thunder mingled with the roaring wind, but, in the glare of the blue lightning’s flashes, the children of Lir beheld each the snowy form of the other. The mad fury of the hurricane yet increased, and the force of it lifted one swan from its wild home on the billows, and swept it through the blackness of the night. Another blue lightning flash, and each swan saw its loneliness, and uttered a great cry of desolation. Tossed hither and thither, by wind and wave, the white  birds were well-nigh dead when dawn broke. And with the dawn fell calm. Swift as her tired wings would bear her, Finola sailed to the rocky isle, where she hoped to find her brothers. But alas! no sign was there of one of them. Then to the highest summit of the rocks she flew. North, south, east, and west did she look, yet nought saw she save a watery wilderness. Now did her heart fail her, and she sang the saddest song she had yet sung. As the last notes died Finola raised her eyes, and lo! Conn came slowly swimming towards her with drenched plumage and head that drooped. And as she looked, behold! Fiacra appeared, but it was as though his strength failed. Then did Finola swim toward her fainting brother and lend him her aid, and soon the twins were safe on the sunlit rock, nestling for warmth beneath their sister’s wings. Yet Finola’s heart still beat with alarm as she sheltered her younger brothers, for Aed came not, and she feared lest he were lost for ever. But, at noon, sailing he came over the breast of the blue waters, with head erect and plumage sunlit. And under the feathers of her breast did Finola draw him, for Conn and Fiacra still cradled beneath her wings. “Rest here, while ye may, dear brothers,” she said. And she sang to them a lullaby so surpassing sweet that the sea-birds hushed their cries and flocked to listen to the sad, slow music. And when Aed and Fiacra and Conn were lulled to sleep, Finola’s notes grew more and more faint and her head drooped, and soon she too slept peacefully in the warm sunlight. But few were the sunny days on the sea of Moyle, and many were the tempests that ruffled its waters. Still keener grew the winter frosts, and the misery of the four white swans was greater than ever before. Even their most sorrowful Gaelic songs told not half their woe. From the fury of the storm they still sought shelter on that rocky isle where Finola had despaired of seeing her dear ones more. Slowly passed the years of doom, until one mid-winter a frost more keen than any known before froze the sea into a floor of solid black ice. By night the swans crouched together on the rocky isle for warmth, but each morning  they were frozen to the ground and could free themselves only with sore pain, for they left clinging to the ice-bound rock the soft down of their breasts, the quills from their white wings, and the skin of their poor feet. And when the. sun melted the ice-bound surface of the waters, and the swans swam once more in the sea of Moyle, the salt water entered their wounds, and they well-nigh died of pain. But in time the down on their breasts and the feathers on their wings grew, and they were healed of their wounds. THEY WOULD SWIM FAR OUT INTO A DIM GREY WILDERNESS OF WATERS. The years dragged on, and by day Finola and her brothers would fly toward the shores of the Green Island of Erin, or to the rocky blue headlands of Alba, or they would swim far out into a dim grey wilderness of waters. But ever as night fell it was their doom to return to the sea of Moyle. One day, as they looked toward the Green Isle, they saw coming to the coast a troop of horsemen mounted on snow-white steeds, and their armour glittered in the sun. A cry of great joy went up from the children of Lir, for they had seen no human form since  they spread their wings above Lake Darvra, and flew to the stormy sea of Moyle. And when Finola and her brothers heard once more the sweet Gaelic speech, and saw the faces of their own people, their happiness was greater than can be told. For long they were silent, but at length Finola spake. Glad then and of great comfort were the hearts of Finola and her brothers. But they could not hear more, for they must hasten to fly from the pleasant shores of Erin to the sea-stream of Moyle, which was their doom. And as they flew, Finola sang, and faint floated her voice over the kneeling host. As the sad song grew fainter and more faint, the Dedannans wept aloud. Then, as the snow-white birds faded from sight, the Sorrowful company turned the heads of their white steeds from the shore, and rode southward to the home of Lir. And when it was told there of the sufferings of Finola and her brothers, great was the sorrow of the Dedannans. Yet was Lir glad that his children were alive, and he thought of the day when the magic spell would be broken, and those so dear to him would be freed from their bitter woe. Once more were ended three hundred years of doom, and glad were the four white swans to leave the cruel sea of Moyle. Yet might they fly only to the wild Western Sea, and tempest-tossed as before, here they in no way escaped the pitiless fury of wind and wave. Worse than aught they had before endured was a frost that drove the brothers to despair. Well-nigh frozen to a rock, they one night cried aloud to Finola that they longed for death. And she, too, would fain have died. And Finola also put her trust in God, and they all fell into a deep slumber. 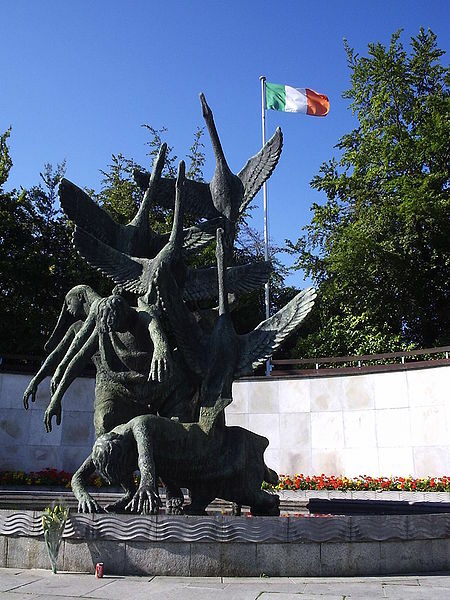 When the children of Lir awoke, behold! the sun shone, and thereafter, until the three hundred years on the Western Sea were ended, neither wind nor wave nor rain nor frost did hurt to the four swans. On a grassy isle they lived and sang their wondrous songs by day, and by night they nestled together on their soft couch, and awoke in the morning to sunshine and to peace. And there on the grassy island was their home, until the three hundred years were at an end. Then Finola called to her brothers, and tremblingly she told, and tremblingly they heard, that they might now fly eastward to seek their own old home. Lightly did they rise on outstretched wings, and swiftly did they fly until they reached land. There they alighted and gazed each at the other, but too great for speech was their joy. Then again did they spread their wings and fly above the green grass on and on, until they reached the hills and trees that surrounded their old home. But, alas! only the ruins of Lir’s dwelling were left. Around was a wilderness overgrown with rank grass, nettles, and weeds. Slowly passed the years, but a great longing filled the hearts of the children of Lir. When would the good Saint come to Erin? When would the chime of the Christ-bell peal over land and sea? With quiet, deep joy Finola answered, “Dear brothers, it is the chime of the Christ-bell that ye hear, the Christ-bell of which we have dreamed through thrice three hundred years. Soon the spell will be broken, soon our sufferings will end.” Then did Finola glide from the shelter of the sedges across the rose-lit lake, and there by the shore of the Western Sea she chanted a song of hope. Calm crept into the hearts of the brothers as Finola sang, and, as she ended, once more the chime stole across the isle. No longer did it strike terror into the hearts of the children of Lir, rather as a note of peace did it sink into their souls. Far stole the sweet strains of the white swans, far across Inis Glora, until they reached the good Saint Kemoc, for whose early prayers the Christ-bell had chimed. And he, filled with wonder at the surpassing  sweetness of the music, stood mute, but when it was revealed unto him that the voices he heard were the voices of Finola and Aed and Fiacra and Conn, who thanked the High God for the chime of the Christ-bell, he knelt and also gave thanks, for it was to seek the children of Lir that the Saint had come to Inis Glora. In the glory of noon, Kemoc reached the shore of the little lake, and saw four white swans gliding on its waters. And no need had the Saint to ask whether these indeed were the children of Lir. Rather did he give thanks to the High God who had brought him hither. These words the four white swans heard with great joy, and coming to the shore they placed themselves under the care of the Saint. And he led them to his cell, and there they dwelt with him. And Kemoc sent to Erin for a skilful workman, and ordered that two slender chains of shining silver be made. Betwixt Finola and Aed did he clasp one silver chain, and with the other did he bind Fiacra and Conn.
Then did the children of Lir dwell with the holy Kemoc, and he taught them the wonderful story of Christ that he and Saint Patrick had brought to the Green Isle. And the story so gladdened their hearts that the misery of their past sufferings was well-nigh forgotten, and they lived in great happiness with the Saint. Dear to him were they, dear as though they had been his own children. The good Saint had indeed come, and the sweet chimes of the Christ-bell had been heard, and the fair Decca was now the Queen of King Largnen. Soon were tidings brought to Decca of the swan-maiden and her three swan-brothers. Strange tales did she hear of their haunting songs. It was told her, too, of their cruel miseries. Then begged she her husband, the King, that he would go to Kemoc and bring to her these human birds. 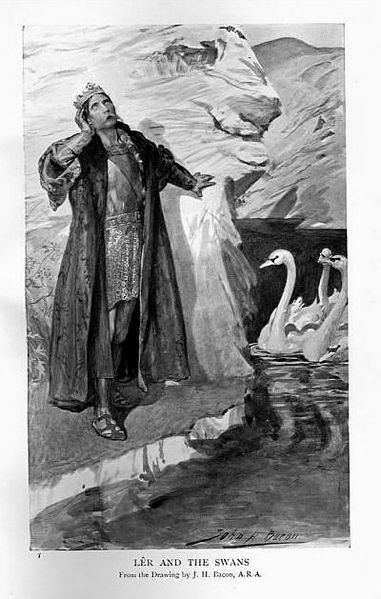 But Largnen did not wish to ask Kemoc to part with the swans, and therefore he did not go. Then was Decca angry, and swore she would live no longer with Largnen, until he brought the singing swans to the palace. And that same night she set out for her father’s kingdom in the south. Nevertheless Largnen loved Decca, and great was his grief when he heard that she had fled. And he commanded messengers to go after her, saying he would send for the white swans if she would but come back. Therefore Decca returned to the palace, and Largnen sent to Kemoc to beg of him the four white swans. But the messenger returned without the birds. Then was Largnen wroth, and set out himself for the cell of Kemoc. But he found the Saint in the little church, and before the altar were the four white swans. “Is it truly told me that you refused these birds to Queen Decca?” asked the King. “It is truly told,” replied Kemoc. Then Largnen was more wroth than before, and seizing the silver chain of Finola and Aed in the one hand, and the chain of Fiacra and Conn in the other, he dragged the birds from the altar and down the aisle, and it seemed as though he would leave the church. And in great fear did the Saint follow. But to! as they reached the door, the snow-white feathers of the four swans fell to the ground, and the children of Lir were delivered from their doom. For was not Decca the bride of Largnen, and the good Saint had he not come, and the chime of the Christ-bell was it not heard in the land? But aged and feeble were the children of Lir. Wrinkled were their once fair faces, and bent their little white bodies. Then did the good Kemoc baptize the children of Lir, and thereafter the Saint looked up, and to! he saw a vision of four lovely children with silvery wings, and faces radiant as the sun; and as he gazed they floated ever upward, until they were lost in a mist of blue. Then was the good Kemoc glad, for he knew that they had gone to Heaven. But, when he looked downward, four worn bodies lay at the church door, and Kemoc wept sore. And the Saint ordered a wide grave to be dug close by the little church, and there were the children of Lir buried, Conn standing at Finola’s right hand, and Fiacra at her left, and before her face her twin brother Aed. And the grass grew green above them, and a white tombstone bore their names, and across the grave floated morning and evening the chime of the sweet Christ-bell.